NBC has given the competition series Making It a second season order. 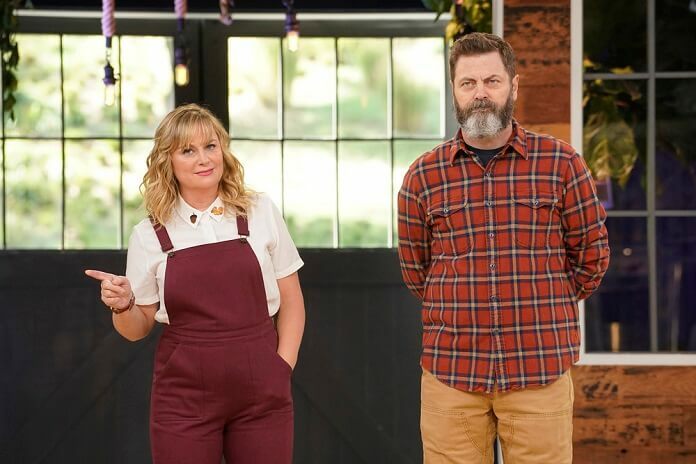 The series, hosted by friends and Parks and Recreation co-stars Nick Offerman and Amy Poehler, debuted on July 31, 2018 and has been a summer ratings winner for the network. It’s first episode brought in 6.3 million viewers. Season one is made up of six episodes and is currently airing on Tuesdays at 10pm ET/PT. Anyone interested in appearing in the show’s second season should visit nbc.com/casting. Amy Poehler, Nicolle Yaron, Nick Offerman, Dave Becky, and Anthony Dominici are the executive producers of Making It. The Plot: In this competition, eight of the most talented makers from across the country have taken on a variety of handmade projects with the hopes of impressing Poehler, Offerman and expert judges Simon Doonan and Dayna Isom Johnson. Poehler and Offerman both share a love and passion of craftsmanship, albeit from different perspectives. Poehler is a self-proclaimed crafting novice who has long harbored a secret appreciation for those who can imagine and execute incredible things by hand. Offerman is a New York Times best-selling author in the woodworking space and is well known for his love for making a variety of objects himself.